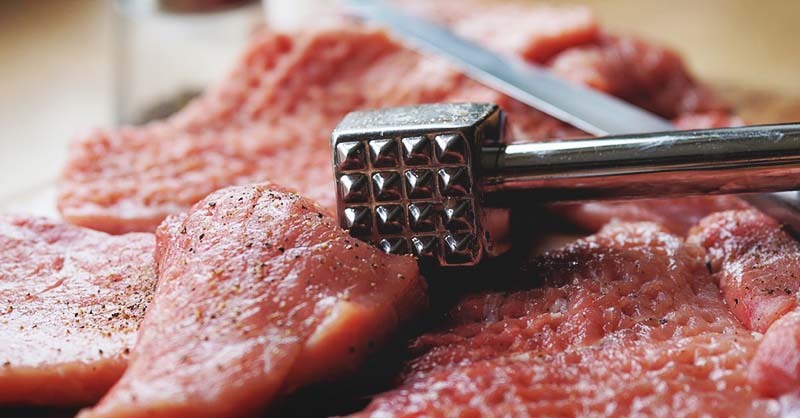 A meat tenderizer is a must-have kitchen gadget for any meat lover. If beef, chicken, lamb or pork features on your weekly menu, a meat tenderizer will create meat dishes that are deliciously tender and full of flavor. 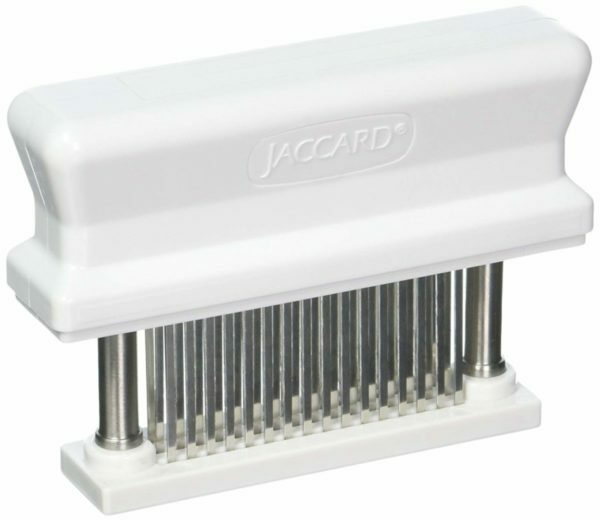 Our top pick for the best meat tenderizer is the Jaccard Supertendermatic 48-Blade Tenderizer. The original Jaccard Supertendermatic Meat Tenderizer is a truly amazing kitchen gadget. Whatever type of meat you enjoy eating, the Supertendermatic will transform tough cuts of meat into tender, succulent, flavorful meat dishes that look and taste like professional culinary creations. 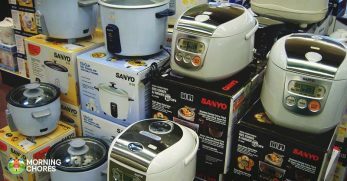 Meat preparation tasks benefit greatly from all different types of kitchen gadgets. Just like a meat grinder or a meat slicer makes grinding or slicing meat quick and easy, a meat tenderizer is a super fast, easy-to-use, ultra-sharp meat preparation tool. 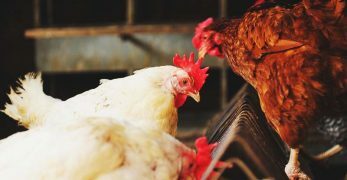 One of the challenges that are often associated with eating meat is that our highly prized pieces of meat can turn out to be dry, tough and hard to chew. Even the best type of marinade can fail to soften or produce the taste infusion we had hoped for. A meat tenderizer will turn thick cuts of meat like ribeye or porterhouse steak, lamb, pork or a whole chicken or turkey into tender, succulent meat that is ready for your favorite spices, seasonings, and marinades. There are three types of meat tenderizers available. A traditional mallet meat tenderizer, a needle-style meat tenderizer, and a commercial mechanical meat tenderizer. 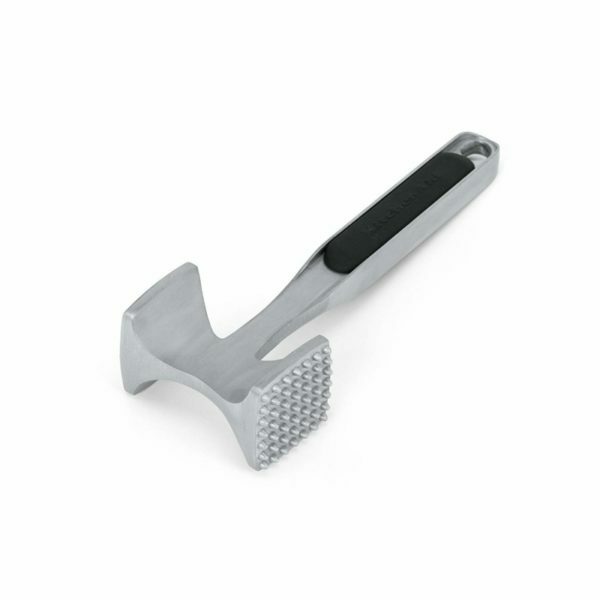 A mallet-style meat tenderizer looks just like a small hammer. Its heavy-duty two-sided metal head has a smooth surface to pound, pulverize and soften the meat and a ridged side for perforating the meat with tiny holes to make it marinade-ready. While this type of tenderizer is perfect for small pieces of meat, it may not be very effective with thicker cuts of meat like beef steak or a whole chicken, and it can be quite messy to work with. For small and large pieces of meat, a needle-style meat tenderizer, like the Jaccard Supertendermatic, the Mr. Bar-B-Q Professional Meat Tenderizer or the Klemoo Meat Tenderizer are the right tools for the job. These tenderizers have a set of razor-sharp metal needles, blades or prongs that are very effective at penetrating up to 1.5 or 2-inches into thick meat and can cut through the tough strands of fibrous muscle tissue. This heavy-duty tenderizing action also creates small channels that allow seasonings, rubs, and marinades to penetrate deep inside the meat. 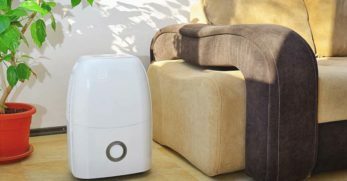 It also reduces the total cooking time by up to 40% and prevents any meat shrinkage. For operator safety, these tenderizers have a plastic disk or plate at the bottom. The blades move through the holes in the disk as you press down on the handle. Once you lift up the tenderizer, the needles then retract back inside the disk so they are not exposed and will not cut your hands. The problems that can occur with a needle-style tenderizer is that the needles, blades or prongs can get stuck in extra thick meat. You may have to apply more pressure with larger pieces of meat. Also, the tenderizer may not be suitable for thinner cuts of meat as it can flatten out the meat so that it loses its original shape. 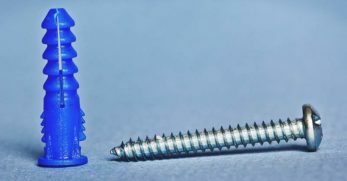 Most needle-style tenderizers have a collection of spring-loaded blades that make the tenderizing process so much faster and safer. The blades can be arranged in a tight circle like the Norpro, a square design like the Koncle, or in a linear straight line like the Klemoo. The number of blades will range from 16, 24, 48 or 56, depending on the tenderizer's design. The more needles the tenderizer has, the faster your meat will be tenderized. The needles, blades or prongs are razor sharp so be extra vigilant when you are cleaning them. Some brands can be washed in the dishwasher, while others must be hand-washed. The safest way to clean the blades is with a brush. A commercial-style mechanical meat tenderizer is specially designed for busy restaurants and people who eat a lot of meat. These free-standing units have a meat feeding shute at the top and a manual crank handle that guides the meat through the machine. The sharp stainless-steel blades are highly effective at flattening and tenderizing large prices of meat. You may even be able to feed the meat back through the tenderizer to turn it into cubes like the Weston Meat Cuber Tenderizer. The only real problem with this type of tenderizer it is best suited for red meat and may not be very effective with wet meat like chicken. An important safety feature to consider with needle-style meat tenderizers is a protective safety guard. 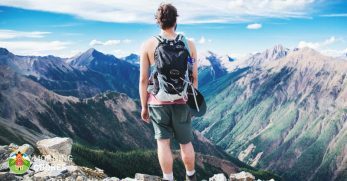 This special plastic cap fits over the blades, which prevents any accidental contact with the blades and allows for safe storage. 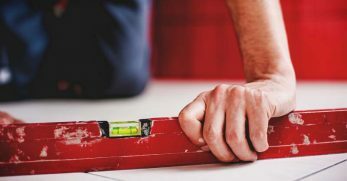 Whether the handle design is horizontal or vertical, it should always fit securely in your hand. 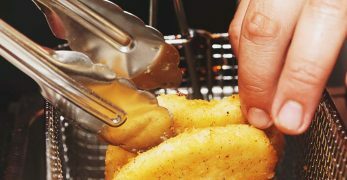 Ergonomic non-slip handles are comfortable to hold and make the tenderizing process so much easier, quicker and safer. Also, a handle that has a locking feature gives you ultimate control over the tenderizer like the Norpro or the XSpecial Meat Tenderizer. OXO is one of the most trusted names in the food preparation gadget industry and their superior mallet-style meat tenderizer is a fantastic choice for any meat lover. The Oxo SoftWorks Meat Tenderizer has a sturdy, strong and durable one-piece aluminum construction. 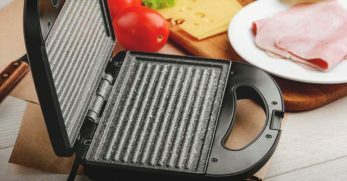 Its double-sided head has a flat smooth side for pounding and a ridged side for perforating, which delivers an optimal tenderizing performance for thin beef, lamb, pork cutlets or small pieces of chicken. Both metal surfaces have a non-stick surface to make sure the tenderizer does not get stuck in the meat. Using the gadget is very easy as its comfortably contoured soft-grip plastic ergonomic handle absorbs any pressure while you tenderize your meat. 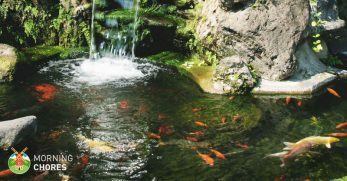 The non-slip design is highly effective in both dry and wet food preparation conditions. The OXO meat tenderizer is very easy to keep clean and it can go straight into the dishwasher. If you are looking for a lightweight meat tenderizer for small pieces of meat, the KitchenAid Meat Tenderizer is a very good choice. The KitchenAid meat tenderizer can be used to flatten and tenderize a wide variety of meats like steak, lamb or chicken. 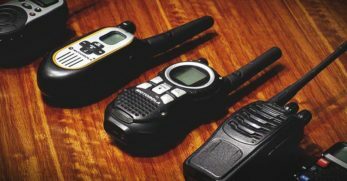 It is lightweight and made from durable aluminum and the double-sided head is strong and sturdy. The smooth surface is effective at pounding and flattening and the textured surface works exceptionally well at tenderizing small pieces of meat and making it marinade-ready. The soft-grip ergonomic handle is comfortable to use while you tenderize your meat to perfection. For easy storage, the handle has a hole at the end, so you can hang the tenderizer up in your kitchen for quick access. You can either handwash the meat tenderizer or put it straight into the dishwasher. KitchenAid offer their meat tenderizer in black and red. The tenderizer is covered by a 1-year replacement warranty and a limited lifetime warranty. Cook up to 50% faster and enjoy tender and flavorful meat with the Spring Chef Meat Tenderizer. The mallet-style tenderizer is made of durable and strong solid aluminum that has a polished rust-resistant chrome plating. 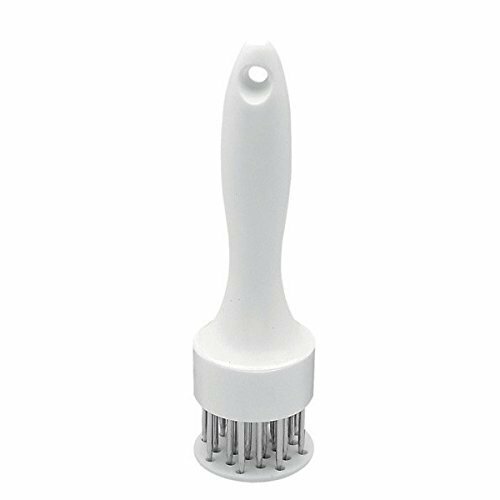 Whether you love chicken, veal or steak, the Spring Chef meat tenderizer is very effective at flattening and tenderizing your meat so that your steaks or cutlets cut like butter. You can use the smooth side to flatten poultry and the textured side tenderizes red meat so that is ready to be seasoned or marinated. Highly functional, the Spring Chef can also be used to loosen up frozen vegetable packages, crack seafood shells, loosen garlic skin, crush garlic, nuts, hard candy, prepare bread crumbs, and break up ice cubes for drinks. The meat tenderizer is especially ideal for people who have arthritis. 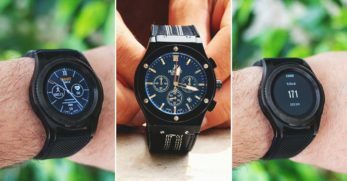 It has a non-slip pressure-absorbing soft-grip black handle and a special weighted head that allows gravity to do all the hard work and saves any strain on your hand. For quick and easy cleaning, the meat tenderizer can go into the dishwasher. Spring Chef offers a lifetime warranty on their meat tenderizer. 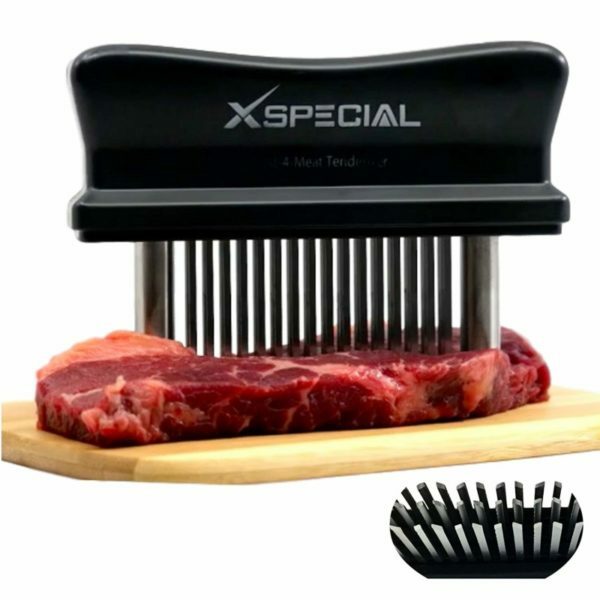 If you are a meat enthusiast, the XSpecial Meat Tenderizer is your secret weapon against tough pieces of meat. For a quick, easy and safe way of tendering thick cut meat like steaks or roasts, the XSpecial Meat Tenderizer Tool does all the hard work for you. The 48 razor-sharp stainless-steel retractable blades lock into place inside the holding disc and penetrate 2 inches into the meat. Your beef, lamb or chicken will be tender and ready for your favorite marinade infusion. The tenderizer has a long-lasting design as the stainless steel blades will never dull, discolor, rust or change shape over time. 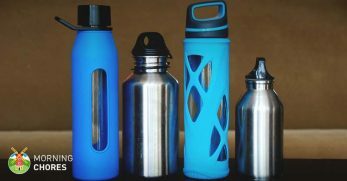 The BPA-free ABS plastic handle is strong and durable and comfortable to use. Although the meat tenderizer is dishwasher safe, it is best to soak it in hot water, hand wash, and leave it to dry. The protective disc can be detached which makes the tenderizer even easier to clean. For safe storage, the meat tenderizer has a protective cover to prevent any accidental cuts from the blades. 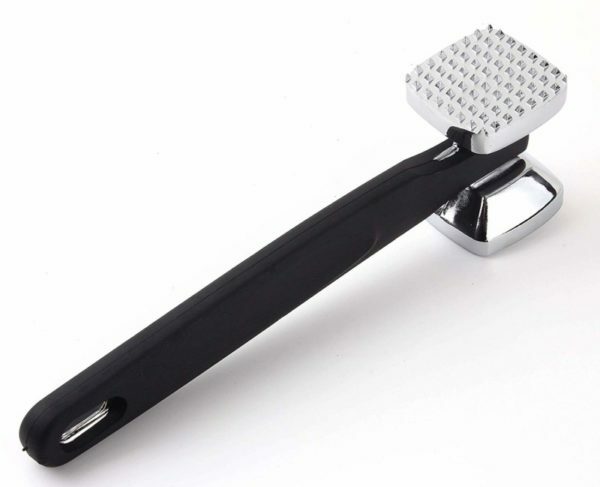 XSpecial offers their meat tenderizer in black or white. You will achieve better cooking results and enjoy tender and flavorful food with the multi-blade Jaccard Supertendermatic Tenderizer. The professional meat tenderizer increases marination absorption, reduces cook times by up to 40% and reduces any shrinkage, which allows the meat to cook evenly. 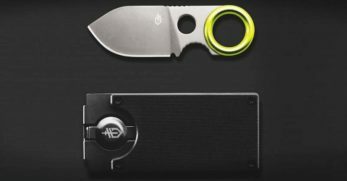 The 48 razor-sharp double-edged stainless-steel retractable blades are securely anchored to the holding plate on the bottom of the unit. As the blades are designed to penetrate 1.5-inches into the meat, they create tiny heat channels that will not change the shape of the meat but allow for faster penetration of seasonings, spices or marinades. 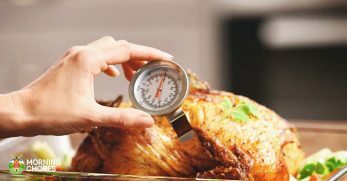 Whether you are preparing small or large pieces of beef, pork, veal, chicken, turkey, venison, or fowl, your meat will be deliciously tender and bursting with flavor. The sturdy white ABS plastic handle provides you with a firm comfortable grip for effortless tenderization. Jaccard also includes a plastic protective cover to protect your hands from the sharp blades. To keep your tenderizer clean, it can go into the dishwasher or use a brush to remove stubborn meat fibers. The Koncle Professional Meat Tenderizer is a great choice for home cooking enthusiasts or a busy hotel restaurant. For quick and easy tenderization, the 56 ultra-sharp corrosion-resistant spring-action blades are deployed when they are pressed into the meat and automatically retract when you lift the gadget up. Your meat will be soft and tender, while seasonings or marinades will create a deeper level of flavor and cooking will be quick and easy. The rounded food-grade ABS plastic handle has a one-touch button that is wide enough to press down as you tenderize your meat. The locking feature also provides you with extra safety during challenging tenderizing tasks with thick cuts of meat. You can safely store the meat tenderizer as it comes with a protective cover that protects your hands from being cut by the razor-sharp blades. The meat tenderizer’s blades can be hard to clean, so soak the tenderizer in warm water, wash with soapy water and use a brush to keep the blades clean. Whether you like to cook beef, fish or poultry, the Norpro Meat Tenderizer will improve the texture of the meat, allow for better marinade absorption, and ensure fast, even cooking results. Highly effective, the meat tenderizer has 24 stainless-steel razor-sharp prongs that penetrate quickly into tough meat fibers and the 2-inch-heavy-duty spring-loaded plastic disk provides precise tenderizing control. As you grasp the sturdy plastic handle and press downwards, the prongs pass through the disk's holes and into the meat. When you release the downward pressure, the spring action mechanism released the prongs, so you can move to another section to tenderize the meat with the same smooth, uniform action. The tenderizer is very lightweight and easy to use but it may require extra force for thicker cuts of meat. 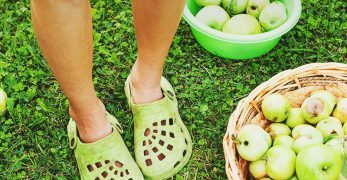 For compact storage, you can put the tenderizer in a kitchen drawer or use the hole on the end of the handle to hang it up out of the way. To keep the tenderizer clean and ready for action, hand washing is recommended. Norpro offers the meat tenderizer in a 1, 2, 3, or 4-pack. If you love your barbeques, the Mr. Bar-B-Q Professional Meat Tenderizer is destined to be your new barbequing food prepping buddy. The 16 commercial-grade 2-inch spring-loaded stainless steel blades are razor-sharp and can quickly penetrate into the toughest meat. 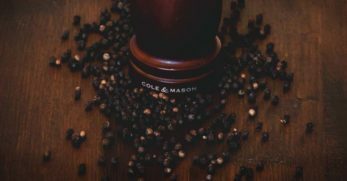 As well as softening the meat quickly, the blades create small holes that allow seasonings or marinades to absorb deep into the meat for rich flavorful results. You can use the meat tenderizer in your kitchen or keep it handy while you grill up a storm on your outside grill. As the tenderizer requires no assembly, it is always ready for some tenderizing action. 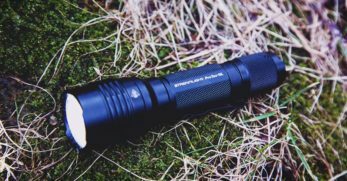 The black handle has a high-grade thick plastic construction that is strong and sturdy and comfortable to use. The smart red and black colored design makes the tenderizer very easy to spot in your kitchen drawer, and it has a protective cover for safe storage. 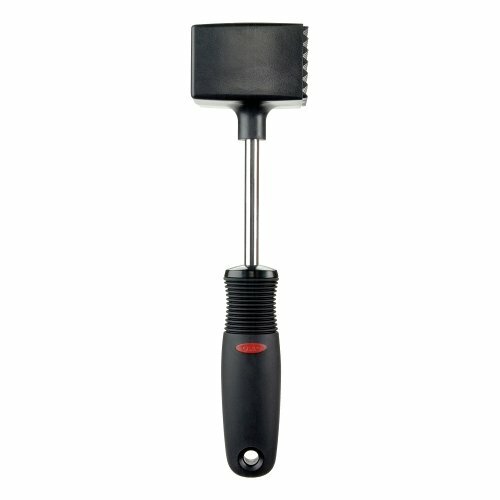 Create deliciously tender and flavorful meat dishes with the KLEMOO Meat Tenderizer Tool. 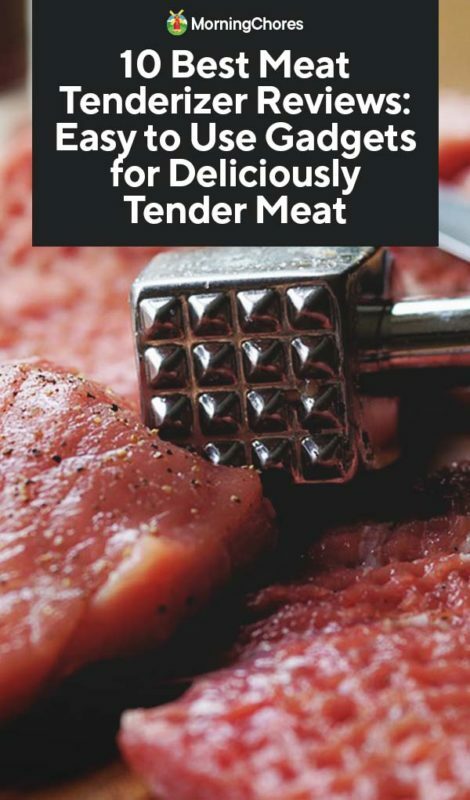 The meat tenderizer has 48 ultra-sharp 420 stainless steel blades that penetrate deep into the meat to break down the connective tissues that make meat tough and chewy. 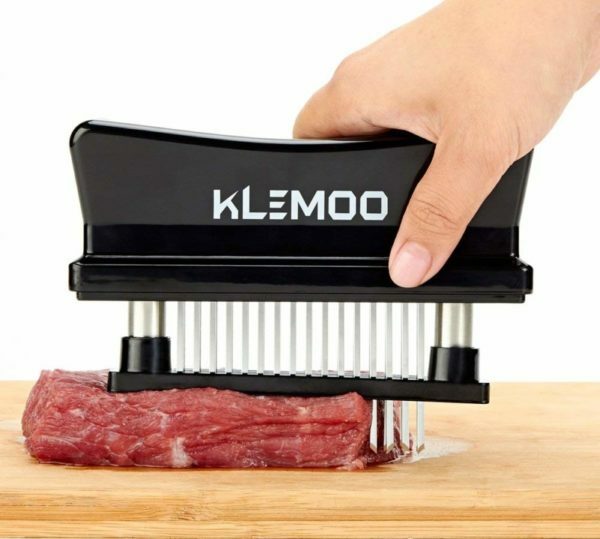 So whether you have small or large thick cuts of meat, the KLEMOO meat tenderizer transforms beef, chicken, pork, wild game, fish, or pork skin into tender mouthwatering gourmet delights. The blades create tiny channels within the meat that allow your favorite seasonings or marinades to be fully absorbed in just 5 minutes. These perforations allow meat to cook evenly, reduce cooking time by up to 40%, maximizes meat’s tenderness, juices, and flavor, and reduce any meat shrinkage. The meat tenderizer has an ergonomic non-slip plastic handle that is comfortable to hold and requires minimal energy even with thick meat. Even though the KLEMOO can go straight into the dishwasher, the best way to clean it is by soaking it in warm soapy water and use a brush. The meat tenderizer also comes with a clear protective cover for safe storage. 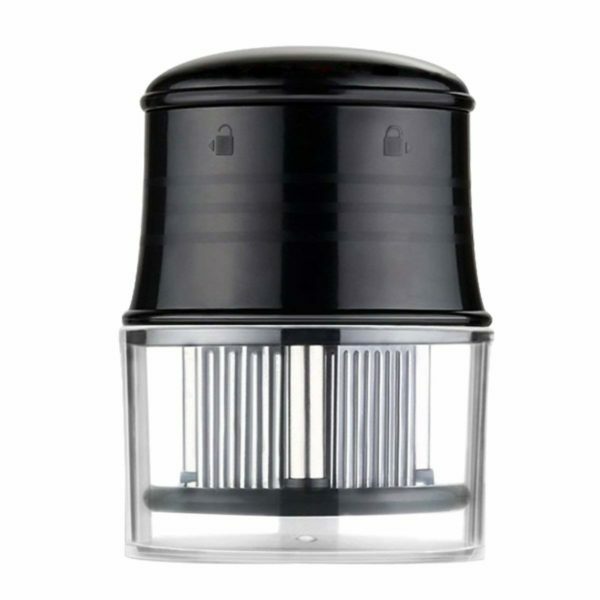 KLEMOO offer their meat tenderizer in black or white. 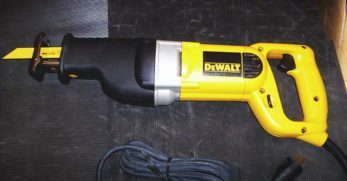 The tenderizer is covered by a 30-day return guarantee and a 1-year warranty. 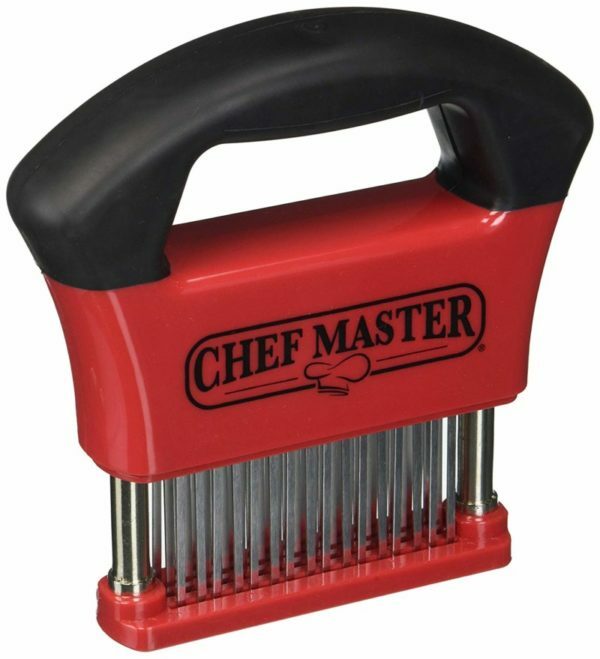 Whether you have a busy restaurant or you are a home cooking enthusiast, the Weston Meat Cuber Tenderizer is an excellent meat tenderizing gadget. The Weston meat tenderizer helps to soften meat and maximize the effectiveness of marinades to enhance the delicious flavor of your favorite meats. 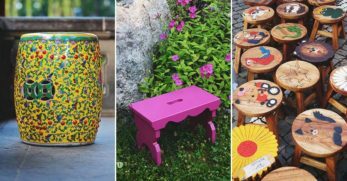 It has a strong and sturdy cast aluminum construction with a food-safe plastic coating and a heavy-duty base. 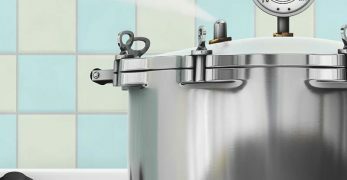 The two C-clamps allows the unit to be securely mounted to a kitchen countertop that is 1½-inches thick, and it has an easy to use sturdy and strong plastic crank handle. You can use the tenderizer for large cuts of meat like steak and chops up to 1¼-inch thick. 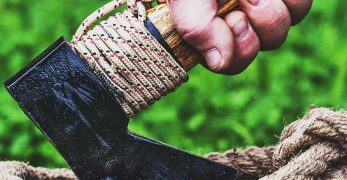 The 31 ultra-sharp stainless-steel blades are highly effective at piercing through tough connective fibers and can tenderize and flatten even the toughest cuts of meat. For a smooth-running performance, the stainless-steel combs stop any meat from jamming in the tenderizer. A highly functional gadget, the meat tenderizer also cubes the meat after it has been tenderized. You can even convert the meat tenderizer into a Jerky Slicing Machine with Jerky Slicer Blades which are sold separately (07-3302-W). 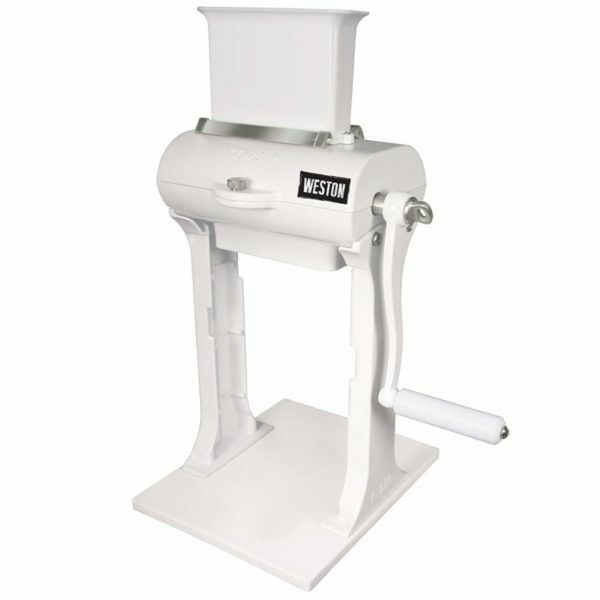 The Weston meat tenderizer has a 2-piece housing design that disassembles for easy clean-up and compact storage. Weston offers a 1-year warranty on their super meat cuber and tenderizer.